Friday, Feb. 20 at 7:30 p.m. — WOODSTOCK — There are many things one might expect to find in an 1800’s farmhouse in Vermont. Sierra Leone’s Refugee All Stars is not one of them. 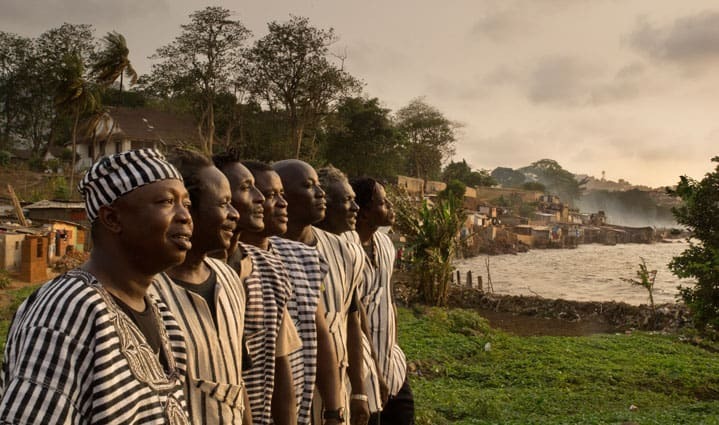 The members of Africa’s most inspirational band took a month long residency in the Green Mountain State in 2013 to lay down tracks on their fourth and latest album, “Libation”; which was later mixed by renowned London-based producer Iestyn Polson, known for his work with David Bowie, Patti Smith, David Gray, and others. Once recording began, news spread throughout the Plainfield, Vt. community that the world-famous band was nearby. Volunteers and fans helped the band with transportation, lodging, musical instruments, phone cards, and most importantly, servings of their favorite chicken and rice. Since those long summer days in the recording studio until now, much has happened both personally and professionally for the Refugee All Stars. They return to Woodstock and join guest performers Sayon Camara and the Landaya Ensemble, to deliver an exhilarating performance, as well as shining a light on the current Ebola crisis in West Africa. Join them at Woodstock Town Hall Theatre on Friday, Feb. 20 at 7:30 p.m. The band has teamed up with the Freetown media production team, WeOwnTV, to produce and disseminate vital public service announcements about effective methods of preventing Ebola in Sierra Leone, as the spread has largely been attributed to a lack of awareness of these simple yet vital prevention techniques. For the rest of their tour, the All Stars will collect donations to WeOwnTV, and will continue to do so until the spread of the virus has stopped and no new patients are reported. Originally from Guinea, Sayon Camara now lives in Woodstock. He is a sought after musician whose skills and talents take him all over the world. The Landaya Ensemble is a New Hampshire-based group that performs traditional West African rhythms and songs. The upcoming concert at Woodstock Town Hall Theatre will radiate the joy and passion for music that have made Sierra Leone’s Refugees All Stars a living testament to the resilience of the human spirit, and an inspiration to hundreds of thousands around the world. For tickets or info, visit www.pentanglearts.org or call 802-457-3981.